There are a few legitimate reasons to keep a credit card in your wallet. It can save the day if you’re faced with an emergency situation, like a car breakdown, when you’re low on funds. Moderate and responsible use also builds credit history, which can help you secure a good interest rate for a larger purchase down the road, such as a house or a new car. In an era where more and more purchases are made anonymously online, credit cards provide a layer of protection against fraudulent transactions. But if your main objective is saving money, you’re better off cutting up your credit cards, or at least keeping them out of sight where you’re not tempted to use them. Here are several reasons why using cash will save you more money than credit cards. If your monthly take-home pay is $4,000, and you aren’t using credit, it is impossible to spend more than $4,000. Even if you don’t save a dime of that money, at least you aren’t going into the hole where your savings are negative (also known as debt). Credit cards make it way too easy to overextend by giving you spending power that exceeds what you can actually afford. According to Woodward Check Cashers, a company that specializes in personal check cashing in Detroit, MI, taking advantage of cashing a check will ensure that any money you happen upon can be converted to cash and allocated wisely within your structured budget. After your credit cards have busted your budget by tempting you to spend more than you make, they continue to haunt you by charging you exorbitant interest on the excess until you pay it off. It is way too common for credit card users to rack up such high balances that they can barely afford to pay the interest due each month, much less the principal. They become hamsters on wheels, scurrying frenetically to get precisely nowhere. Cash users don’t have this problem, as using cash makes it impossible to ensnare yourself in the financial quagmire known as debt. 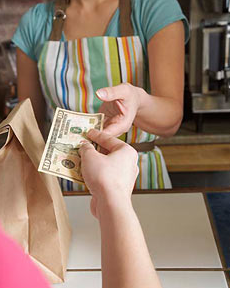 When you make a purchase using cash, you physically part with your money. You see it leaving your wallet. When you swipe a credit card, the actual monetary transaction occurs out of sight, so it doesn’t have the same visceral effect. This makes it easier to spend indiscriminately. The act of making a purchase with a credit card is the same whether it’s $1 or $1,000. You swipe your card then walk away with your shiny new trinket. Having to hand over $1,000 in cash and seeing the flattening effect it has on your wallet is much more likely to make you ask yourself if whatever you’re buying is really worth it. If you want to save money, cash is king. You will be shocked at the savings you can accumulate after only a few months of removing those plastic debt traps from your life!